For the symptomatic relief of hyperacidity (excessive stomach acid) and gas or flatulence associated with the diagnosis of peptic ulcer, gastritis, peptic esophagitis, gastric hyperacidity and hernia. Adults: chew 2 tablets 4 times daily, taken between meals and at bedtime or as directed by a physician. Do not chew more than 20 tablets in a 24-hour period or maximum dosage for more than 2 weeks except under the advice and supervision of a physician. Children 10 to under 12 yrs of age (weight of 45-55Kg) -Give 1 1/2 tablets up to 4 times a day. Children 8 to under 10 yrs of age (weight of 25-45Kg) -Give 1 tablet up to 4 times a day. Children 6 to under 8 yrs of age (weight of 18-25Kg) -Give 1/2 tablet up to 4 times a day. Children under 6 yrs of age is not recommended. Caution use in patients with mild to moderate renal impairment or chronic renal failure. Avoid prolonged use and intake of large doses. Monitoring of patients on hemodialysis or antacid therapy is recommended. This product contains Tetrazine which may cause certain allergic reactions including bronchial asthma to some susceptible persons. 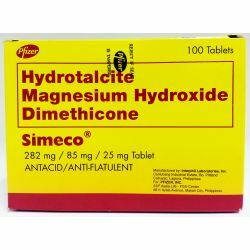 This product should not be given to patients with symptoms of appendicitis since these products may increase the danger of perforation or rupture due to their constipating or laxative effects. It is also not to be given to patients with severe renal functunction impairment due to increased danger occurance of hypermagnesemia.